I have heard that beer is good for your hair, and I remember reading back in the day (haha) that pouring a can of beer on your hair and letting it sit can do it some good and make it shiny. This masque was virtually the same as that, with an addition of an egg yolk. I admit, it's a bit of a weird, gross combo--but if you can get past that--it really works! I found this recipe on the Internet randomly. 1. 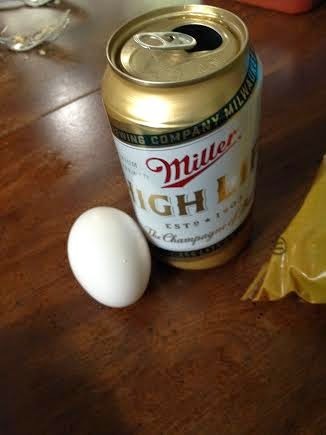 Mix the yolk and beer together. Silly me, I poured the yolk right into the can and then shook it up. Naturally, it exploded all over my pants and I smelled like a drunk, just in time for work. Umm...yeah. Don't do that. LOL! Save this for the weekend when you have nowhere to go! 2. 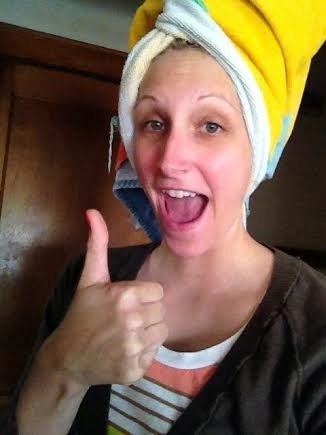 Pour the mixture all over your hair, and wrap it up in a shower cap or towel. Let sit for 30 minutes. 3. Rinse your hair with warm water until the water runs clear. Shampoo hair as usual, but do not condition.